For a while I’ve been trying to dream up a test that could illustrate the effectiveness of reflux de-aeration with the champagne bottle manifold. Of course you can smell the absence of oxidative aromas in de-aerated lemon juice but not everyone smells so well, not even experienced culinary professionals. A better test would be something visual which made me think of apples. Apples are subject to oxidative browning which many people are well aware of. The juice starts out pale and fairly clear like white wine then slowly turns brown before your eyes. My hope was that de-aeration could remove enough oxygen to prevent any visible browning. This might be achieved without even adding any ascorbic acid as anti-oxidant. Using only reflux de-aeration, the juice of green apples stays green and the highly carbonated product is delicious even by itself with no added sugar or acid. The green apples were juiced with an Acme centrifugal juicer. The juice was then quickly funneled into a champagne bottle (a clear bottle!) and reflux de-aerated at 65 PSI. Centrifugal juicers are known to whip a lot of air into the juice accelerating browning but miraculously reflux de-aeration takes the oxygen right out. Once the oxygen was vented, the juice was carbonated to 8 g/L of dissolved gas which gives it quite the sparkle. 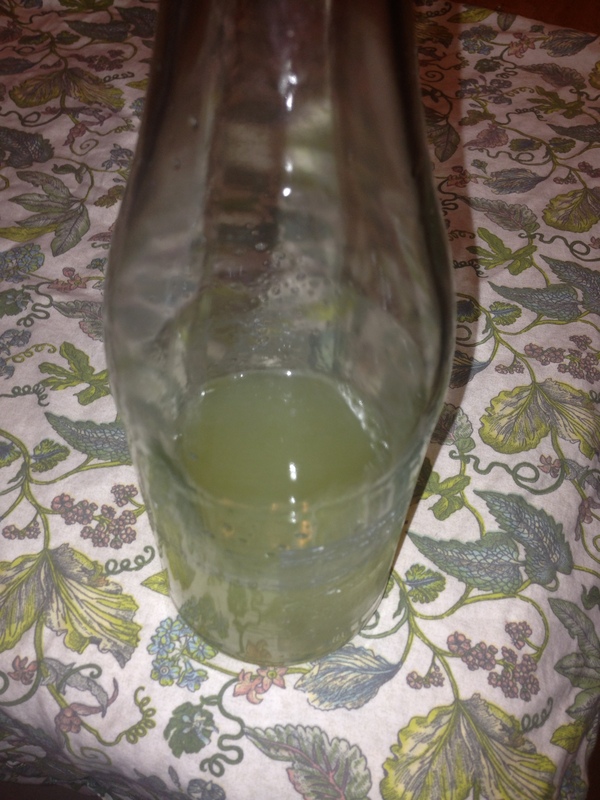 At this point the unadulterated juice is turbid and has some sediment which might irk some neurotics, but the settled juice could easily be racked before carbonation to remove most of the particulates. To clarify the unadulterated juice within reason on the larger scale (gallons), I bet the juice could be de-aerated in a 3 gallon keg, allowed to settle, then racked off by use of a floating down tube. Production is pretty quick, low foot print, and economical. No enzymes, no agar clarification, no centrifuges (even though I love those techniques!). 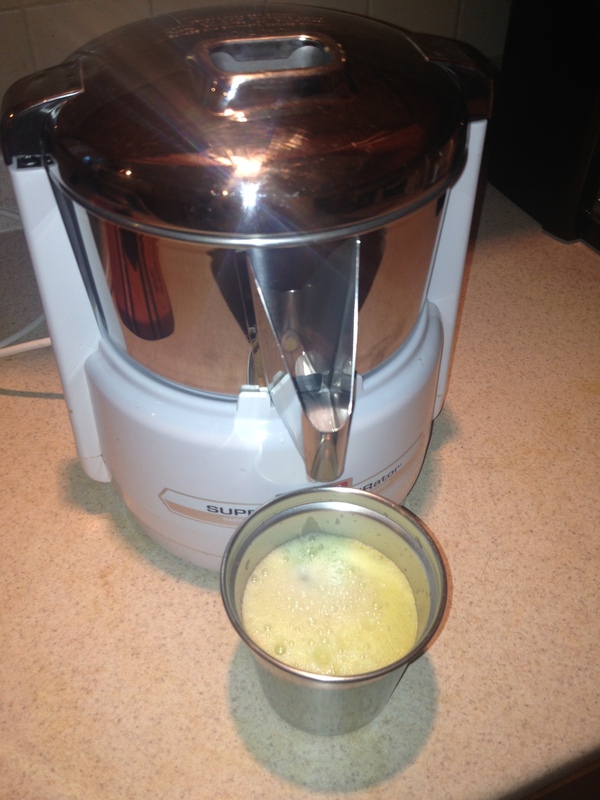 Just plain old raw juice, reflux de-aerated. I found your blog in the comments of Jeff Morganthaler’s article about carbonation. First off, thanks for sharing your knowledge! Second, once the apple juice (or any fresh juice for that matter) is de-aerated, how long would you expect it to last in refrigerated temperatures before the quality diminishes? I’m starting to get into making sodas at home, and wondering how long fresh fruit sodas will last without preservatives. Hi Derek. I haven’t tested much that didn’t have alcohol so I don’t have the best answer. I did age alcoholic cocktails for as long as nine months and never detected any aromas related to oxidation once de-aerated. But besides oxidation, for non-alcoholic sodas, you will still face other obstacles such as yeast and bacteria action. I suspect the sodas might only last a week or two when refrigerated but this will very depending on the raw ingredients and how much microbial stuff they harbor. Contrary to popular belief, both yeasts and bacteria can be active at fridge temp so simply putting bottles in the fridge doesn’t turn off that activity. Interestingly, but not systematically explored, is the impact of pressure on yeasts and bacteria. Excessive pressure can actually slow microbial activity, but without alcohol this is still not likely to put you beyond a few weeks. I was hoping that I could inspire a few people to play in this strange territory and share their results so please check back in and share your results!